Nearly thirty years ago I visited Natchez, Mississippi. It is a beautiful and picturesque city situated on the banks of the Mississippi River. It is dotted with grand, historic mansions. We were led around town by a local guide. At one point she made reference to the War of Northern Aggression. I raised my hand to ask about this unknown war. “I have never heard of this war in all my years of study.” She said, “Y’all know, the war that began in 1861 when the Northern states attacked the South.” I said, “Oh! You mean the Civil War.” “No,” she retorted, “The War of Northern Aggression.” I opened my mouth to argue some more, but others advised me to let it go. Perhaps I should not have. The Civil War was not so much fought over secession. It was about slavery. Southerners believed that other human beings could be bought and sold like property. They were willing to die to preserve this horrible idea. The South lost. And yet, as this weekend attests, the struggle continues. We continue to fight over the idea first taught in the Book of Genesis that all human beings are created in God’s image. All people, regardless of race, religion or gender, contain a divine spark. All are equal in God’s eyes. 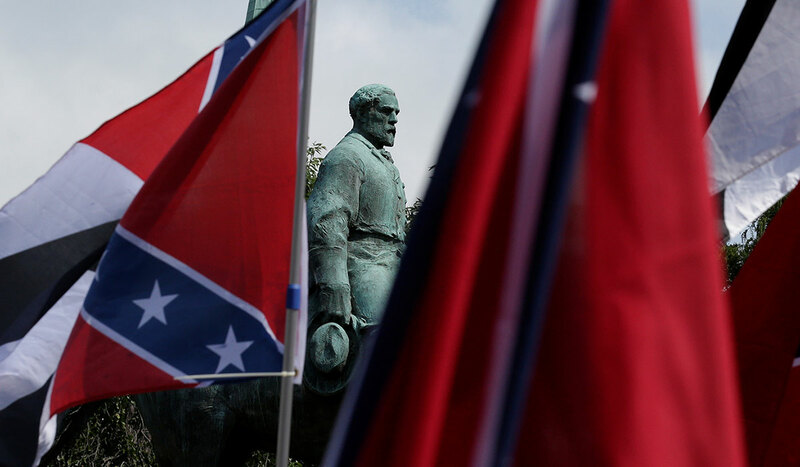 In Southern cities there remain statues to heroes of the Confederacy. These must now come down. General Lee may very well have been a great military leader. I do not, however, feel qualified to make such judgments. About this I am certain. He fought to preserve an idea that must be expelled from our collective conscience. Whites are not better than Blacks. Instead, all must be judged by their acts, by their accomplishments. As a nation, the time has long since passed to remove such statues from our squares. A statue of General Lee belongs in a museum. A confederate flag must serve only as a lesson in history. Never again can it be an object of veneration. Symbols inform our conscience. They help us to write a better future. The statues and flags we adorn our public squares with go to the heart of who we wish to be. The ideology that one race is superior to another is decidedly un-American. We did not always believe this to be the case. That is what we learn from history. That is why we read. That is why we ponder the past. We pore over its details. We do not wish, however, to return to there. It should not be so difficult for our leaders to condemn an ideology that once ripped our nation apart. This is what the KKK wished to accomplish in Charlottesville. This is what hate groups thrive on. Sadly, this is what President Trump fomented during the campaign. Now that he is president one hopes, and prays, that he might offer healing, that he will live by the words he belatedly offered. Indeed, racism has no place in America. What happened in Charlottesville was not about violence, although my heart breaks for those injured, killed and most especially for the family of the young woman murdered. It was, instead, about the ideology that spawns such violence. Neo-Nazis wish to resurrect a similar ideology. I know of no statue of General Rommel in Germany. He fought to preserve an abhorrent idea. The Nazis believed that one race is superior to another. Again, we fought a war against this idea. A continent was torn apart by this idea. Again, it was not so much about the Nazis annexing parts of Czechoslovakia and invading Poland. It was, instead, about their belief that the Aryan race is superior to others. It was about their thinking that Jews are therefore deserving of extermination. Six million of my people were murdered before this idea was defeated. Yes, it is personal. I still feel the suffering and pain this ideology caused. Recently I visited Amsterdam. Like so many others I journeyed to Anne Frank’s house. Along with hundreds of people from what appeared every corner of the world, we quietly walked from room to room. Slowly we ascended from the factory to the upper floors. We made our way passed the bookcase that hid the entrance to the attic. We ascended the steps. The room closed in on us. The beautiful city disappeared from view. The sky became hidden. In the small attic, the world’s light was closed out. For over a year, the Frank family hid from the Nazis. They hunted Jews like one chases after vermin. Eventually the Franks were found. Anne was murdered at Bergen-Belsen. Her father Otto was the only one who survived. Her diary, however, was saved. It serves as a reminder of two things. On the one hand, it reminds us that there were 1.5 million Anne’s who were likewise murdered by this idea. On the other, it teaches us that one young woman can offer us hope. We fought wars against ideologies that block out the sun’s light, that can push our cities toward chaos. The task, then, is to never again allow these ideas to be awarded air to breathe. It requires us to take down the statues. And perhaps build more museums. It demands that our leaders speak out in clear, unmistakable terms. And yet after this weekend, I fear the battle continues. I, for one, will no longer let it go.